The Washington Manor and Littlepage Terrace Housing Projects in Charleston, West Virginia, were created under the Works Progress Administration (WPA) of the New Deal Program, which was implemented by President Franklin D. Roosevelt in the 1930s as an economic boost for the United States during the Great Depression. 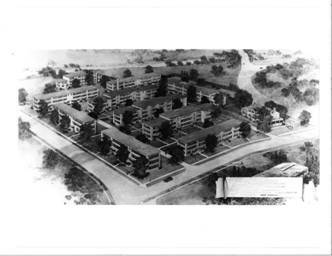 Washington Manor and Littlepage Terrace were the first two low income public housing projects authorized in West Virginia under the WPA, but similar projects in Mount Hope and Huntington followed shortly thereafter. Construction dates for the projects are ca. 1939 and 1940. WPA housing projects were built in various cities through the United States, including Chicago and New York, and were designed to provide better living conditions for low income residents living in urban slum areas. At the time, public housing was considered a viable solution to the problems associated with the growing urban slums, unemployment, and insufficient or inadequate housing. The current stigma associated with public housing or low income housing was not prevalent in the 1930s. 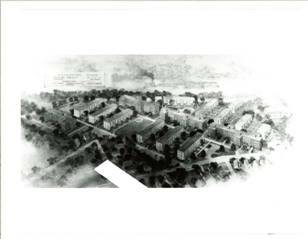 As a result of the current changed approach to high density housing projects, Washington Manor and Littlepage Terrace were razed and rebuilt in smaller cluster style projects and more emphasis given to integrating housing throughout the community. While the different WPA projects around the country did not follow the same architectural styles or plans, residents who qualified based on varied income and family size requirements were able to move into modern, clean, safe apartments. Washington Manor and Littlepage Terrace had hot and cold water, modern appliances, laundries, social rooms, and playgrounds. The grounds were landscaped with a variety of flowers, bushes, and trees, and had water basins for summer use.